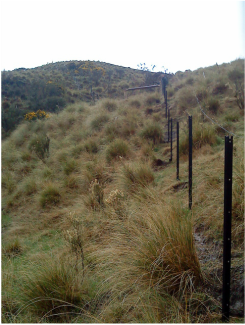 All Fencing Solutions are more that happy to undertake your farm fencing needs, weather you need Deer Fencing, Sheep Fencing or Dairy fencing. All Fencing solutions have a 140HP 4WD tractor with a Fence Pro post driver on the back. This combination allows us to drive posts in some fairly steep terrain. We are able to drive posts in areas that have rock as the Fence Pro driver is fitted with a rock auger and failing that we can use explosives for extreme rock. Being a side mounted driver we are able to drive down the side of the fence line and post as we go with very little adjustment to the tractor position. This allows us to maintain a high work out put for our clients. All Fencing Solutions have a trailer compressor with a warritah rattler and rock drill to enable them to quickly put warritahs into any sort of ground. We consider our wire work to be above average quality and pride ourselves in making fences that will stand the test of time. All Fencing Solutions are often involved in the breakdown of larger blocks of ground into smaller lifestyle size blocks. As such we are aware of boundary issues that can come up from time to time and All Fencing Solutions staff are able to liaise with neighbour's as required. All Fencing Solutions also realise the importance of following boundary pegs so there are no legal issues later on. All Fencing Solutions are able to build your cattle, deer or sheep yards. We are able to assist in the design, layout and advise on the best location for the yards to suit the property. We are able to build stock ramps to load trailers or large transport trucks as the case may be. All Fencing Solutions can undertake Security fencing as required. This may include barb top wires and steel posts or be as simple as netting on wooden posts. We can fence tennis courts using the same systems. "We look forward to the opportunity to come and see your project be it small or large"